Those who follow me on my Twitter, Facebook or Instagram accounts may have spotted the #BlogCampRiverCottage hashtag putting in a number of appearances last week. Back in May, Foodies 100 announced that they would be running a food bloggers event at River Cottage HQ in the Autumn. I duly applied for a place and crossed my fingers and toes. When I received the email to say I was on the guest list I'm sure my excited scream could be heard all 600 miles away in Devon. I would definitely be the furthest travelled blogger at this event! 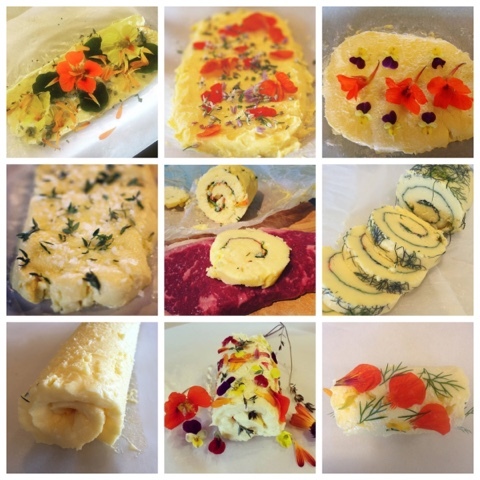 If there was one thing that encompassed for me the whole ethos and excitement of the day it had to be making an Edible Flower Butter Roulade. 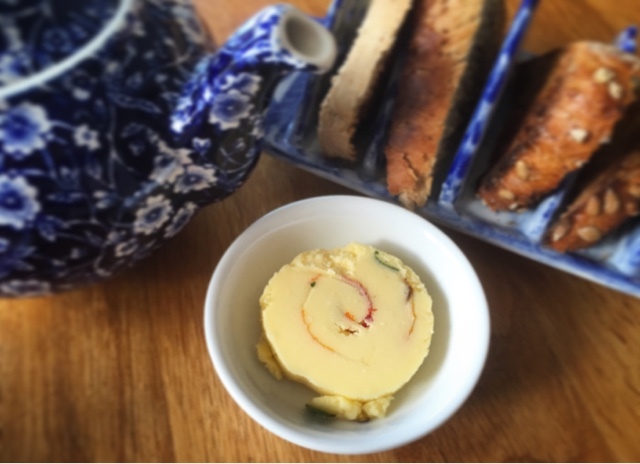 I've made my own butter on numerous occasions, often in jam jars as part of my children's cookery classes and outdoor food and foraging events. 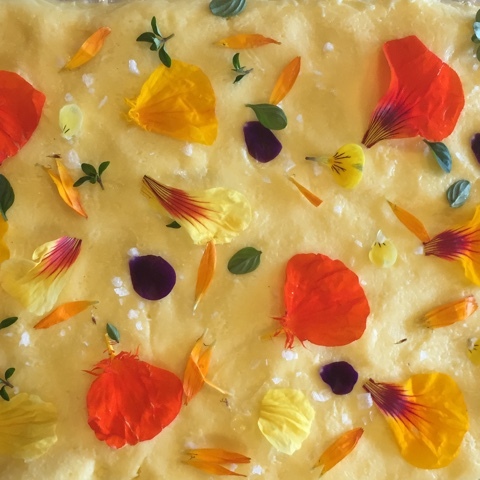 However at River Cottage we went one step further and filled the butter with beautiful edible flowers from their stunning Victorian vegetable garden. Instructions of how to make your own at the end of the post but firstly some photos that sum up a fantastic day. Our day comprised of three group sessions alongside networking with fellow bloggers and a sumptuous two course lunch. First up was Food Styling and Photography with the lovely Capture by Lucy of whom it was a delight to finally meet having stalked her online for so long. The Bread and Butter Cookery session was led by Group Head Chef Gill Meller (The bread part will be revealed in future post - I promise it's worth the wait) whilst Head Gardener Will Livingstone took us on a farm and garden tour. 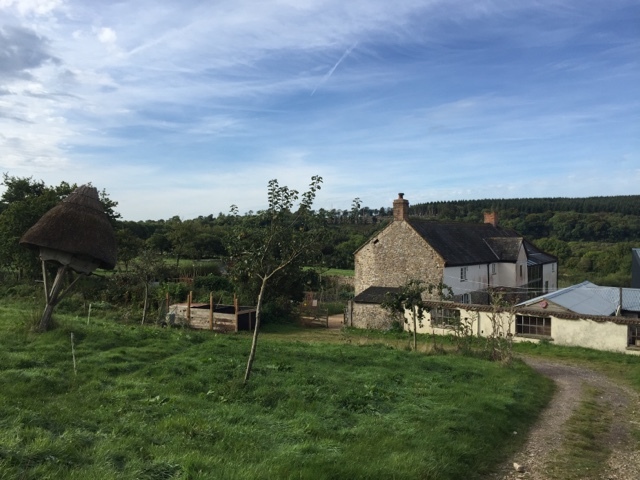 River Cottage HQ is a 90 acre certified Organic mixed farm. Livestock wise they have beef cattle, large black pigs, sheep, chicken, ducks, guinea fowl and bees. Everything grown on the farm stays on the farm and there is a 30 mile food sourcing policy for their additional requirements. Vegetables are grown in two poly tunnels and the kitchen garden. The Victorian style garden is divided into four plots with a Mulberry tree in the middle (alas there were no takers when I suggested we dance around it). 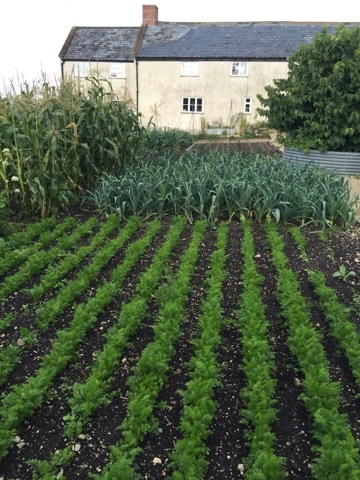 Brassicas, legumes, roots and onions and 'everything else' are rotated annually to help reduce pests and diseases and avoid the depletion of nutrients. 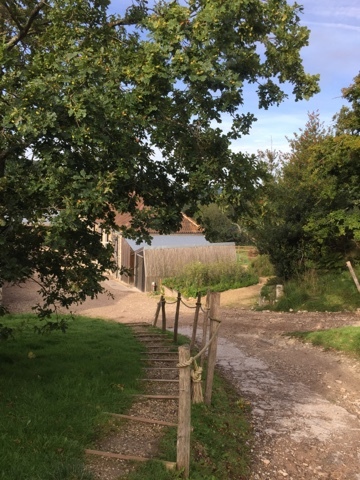 The farm aims to be as sustainable as possible with a wind turbine, solar panels, reed bed system for sewerage and biomass generator for heating and hot water. 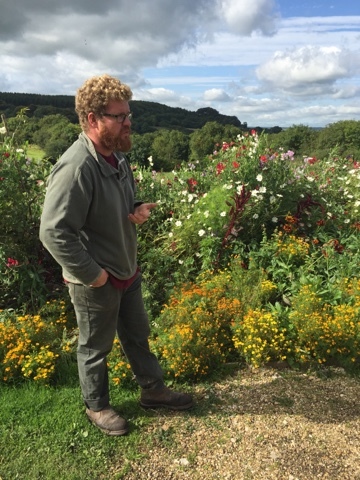 As he showed us around and answered our many questions Will's passion for local, seasonal, organic food shone through, as it did with the whole River Cottage HQ team throughout our day. At last it was time to head to the cook school and get hands on. Use a wooden spoon to continue to beat and press against the side of the bowl until you have butter and buttermilk. Take small balls of the butter into your (ideally cool) hands and squeeze out excess buttermilk. Wash the butter in iced water to help prolong its life before squishing it out onto a sheet of greaseproof paper to form a rectangle. Sprinkle with salt if desired and top with edible herbs and flowers. Run a knife between the butter and the baking parchment before rolling the butter up "swiss roll" style. Place the butter roulade on a fresh sheet of parchment and wrap it up like a Christmas cracker, twisting the ends to secure. Of course I now had the added complication of requiring to transport my butter 600 miles home. It made it safely back to my B&B, the gorgeous Fingle in Uplyme, Lyme Regis. My landlady Jane kept it in the fridge for me and I enjoyed a slice of it on toast for breakfast on my final day in Devon. Alas by the time it spent the day in a suitcase in the boot of my hire car and onwards to Exeter, Manchester and Aberdeen airports it didn't look quite so pretty! 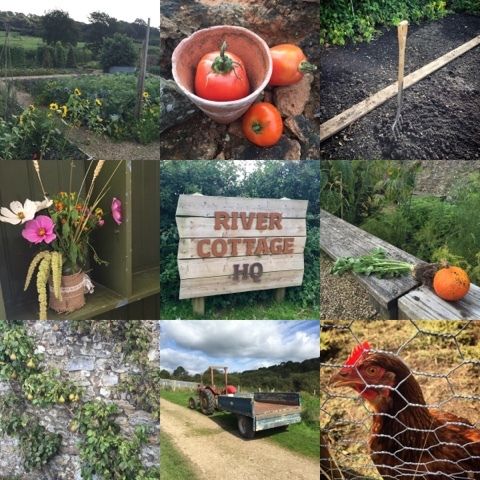 Disclosure - I attended #BlogCampRiver Cottage as a guest of Foodies 100 and River Cottage HQ. All views expressed are my own. What a great day out and that butter sounds lovely. I want to make some for my next supper club, it would go down so well! It would be absolutely perfect for a supper club. Looks very impressive but is actually deceptively simple. This looks so wonderful, I must try it! A friend made some butter the other week with Black Sea salt (I'd never heard of it) and another with seaweed flakes - both gorgeous! That, and this, has inspired me, thanks! Looks like a brilliant event too! It was such a fab day. So inspirational. Lovely to meet you too. It looks like you had a great time. I am sad I missed it. 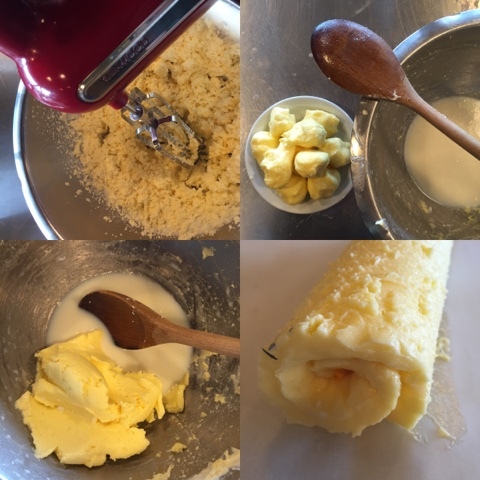 The butter sounds really good too - we love making or own flavoured butter. Butter making is so much fun. Folk who have never done it before are always so surprised that it's just double cream. This is stunning looking and I am sure it takes great. I have been planning to make jam jar butter with my kids for a while and must do it this weekend. Very motivated after seeing this! It was absolutely beautiful. Glad that I've motivated you to give it a try. 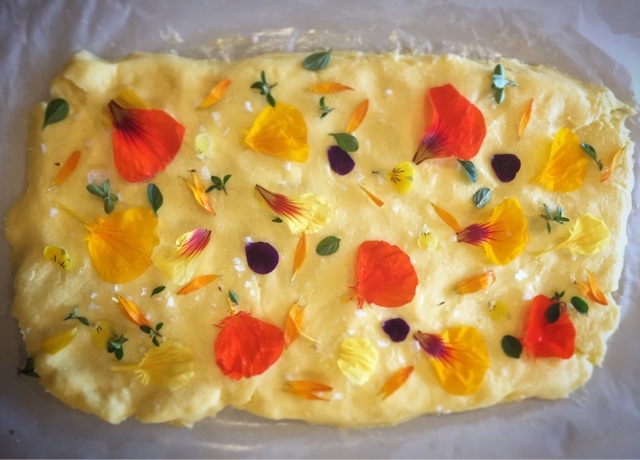 I've not used edible flowers all that much previously but this has really opened my eyes to the possibilities. Sometimes simple is best. So many beautiful colours in nature. Thanks Nayna. It was indeed a great day and fab to meet you. What an awesome experience for you. River Cottage is one of my favourite shows! I'm enjoying the Australian edition at the moment. Your butter is so pretty. Definitely encoraging me to have a try at making my own butter. Oooh an Australian edition sounds interesting. Do try butter making. Its very satisfying. It was such an incredible experience. Learned so much and met some fab folk. I'm with you on that. Salted Butter and Sweet Jam on toast is breakfast perfection. I have not tried edible flowers in a long time. The one that I used to have often were zucchini blossoms covered in batter and fried. This looks really interesting and not that difficult to make for special occasions.